Happy Sunday, space fans! 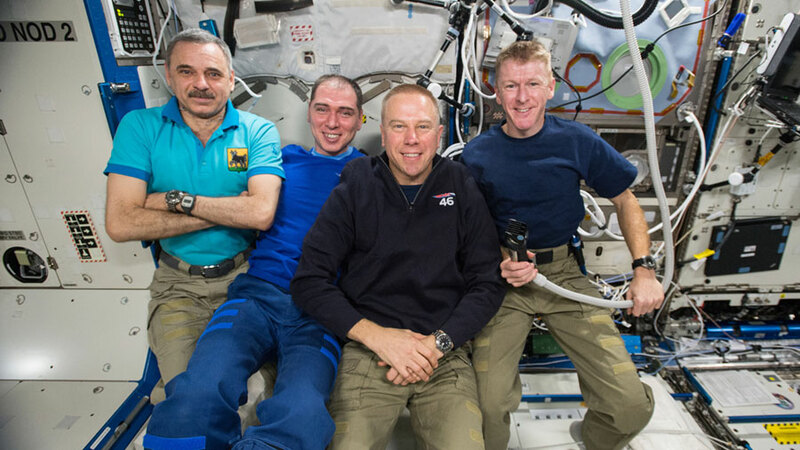 Here's what was up on the International Space Station this week. 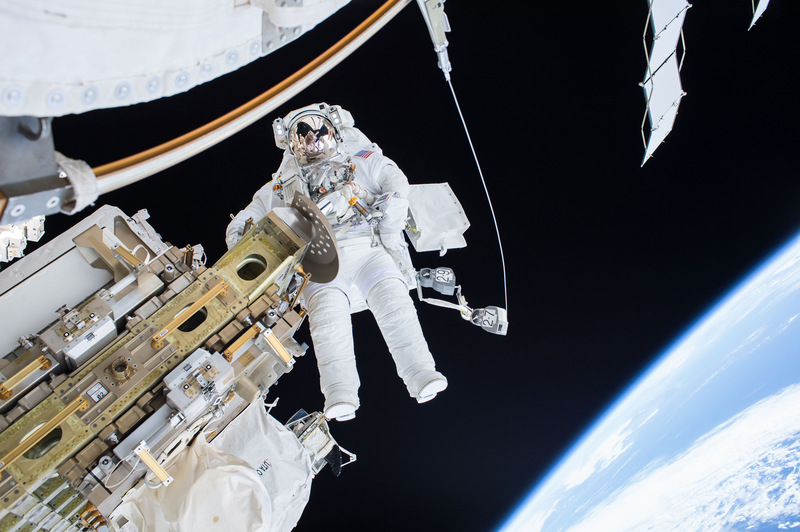 New year, new gear: astronaut Tim Kopra on a spacewalk in December. new gear installation and maintenance. This week, One Year Crew astronaut Scott Kelly and cosmonaut Mikhail Kornienko are set to conduct experiments concerning fluid shift to their heads. While living in microgravity, the fluids of the body collect in its upper half, in a way quite unlike the interior flow inherent to living on Earth. This pooling of fluids can affect many things, particularly eyesight. The astronauts will use negative pressure and head scans to better understand how the fluid shifts affect various regions of the upper body and skull. Kelly, incidentually, was featured on the Jimmy Fallon Show this week, as part of the "Thank You Notes" segment. Kelly, in a video recorded from the ISS, sent a thank-you note to living in space for a year, as it has given him a good excuse to dodge one of Earth's more insidious evils. 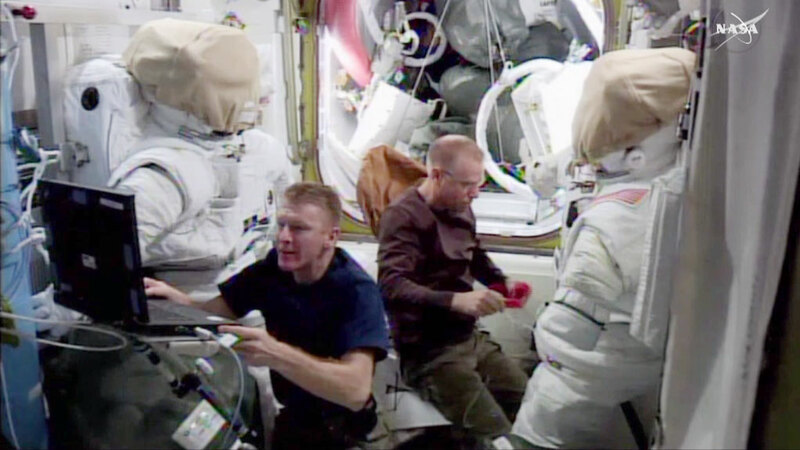 This Friday, astronaut Tim Kopra and ESA astronaut Tim Peake are scheduled to conduct an extravehicular activity (spacewalk) to replace a failed voltage regulator outside the ISS. The new regulators will restore power to one of the station's eight power channels. They will exit the station via the Quest airlock and spend some 6.5 hours outside. Also included in their tasks is running more cable for a future International Docking Adapter, which would allow more spacecraft to be secured to the station. A briefing on the spacewalk will be broadcast via NASA TV on Tuesday. "Do you want the dubstep playlist or the soft jazz for the mission? Perhaps some '90s teen-pop hits?" "Dude, if you put Britney Spears in there again I'm gonna throw all your tea out the airlock." Astronauts Peake and Kopra (L-R) check their spacesuits before the excursion set to commence on Friday. In other space science news, the cosmonauts aboard the station investigated how electromagnetic fields and microgravity can affect coulomb systems (crystals and liquids) that are created in microgravity. The results could further the understanding both of electromagnetic effects in space and the unique growth of crystals in the microgravity environment. "No scientific data can account for the weird growth of your crazy ginger hair though, Peake." "Shut up Sergey, or I'll shave the Union Jack into your fade." 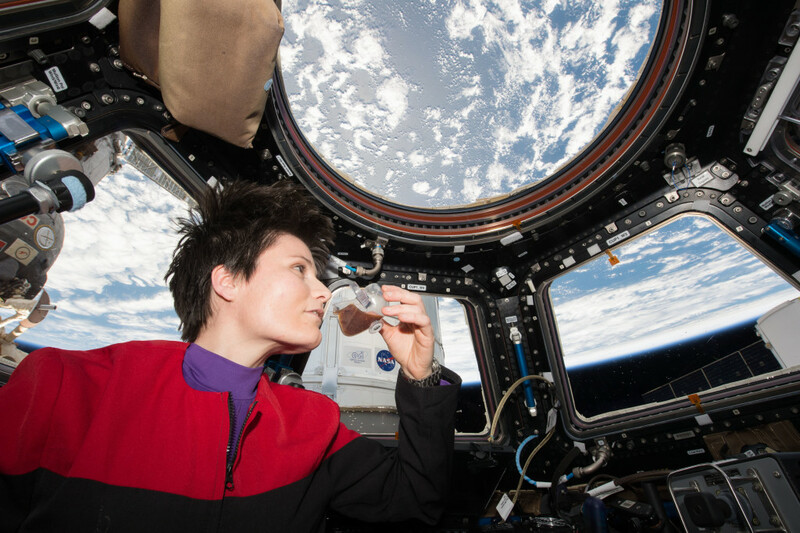 Regarding some of the successful research that the ISS conducted over the last year, the ISSpresso cup (a specially-designed coffee cup that allows for espresso to be drank like a normal beverage, and not from a space-pouch) was awarded an accolade as one of Wired's Most Cleverly Designed Objects of 2015. Not bad, for an invention that astronaut Don Pettit had originally assembled from the cover of a flight manual! during her mission last year. And finally, astronaut Scott Kelly hasn't let all the space-based shifting of skull fluids mess with his art in the least. He continued to capture some amazing imagery this week, adding to his extremely inspirational collection of "Earth art." That's all for this week, space fans! We'll see you next Sunday with more details on the spacewalk and all things Station. Watch this space! "Day 282. Soyuz silhouette and sunset colors of our magnificent Earth." "Day 285. South East Asia giving us the green lights tonight!"